Last night I got together with the 25mm Empire gaming group around the corner from home. I had not seen them all for a while so it was good to catch up. We began a new game between a corps of Austrians and a corps of French. I will post pics once it gets underway. In the meantime, are you all familiar with this painting done by a Frenchman by the name of David? Peter, from the 25mm group I game with, painted up his own version of it in 25mm. Your friend paints well, but why did he cahnge the color of the horse's face. 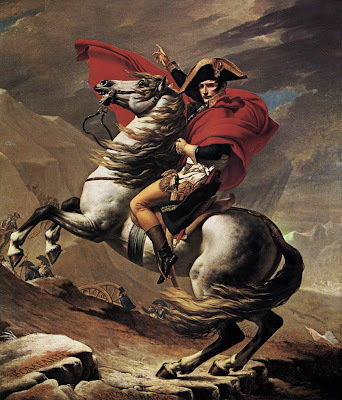 In the painting, is the horse not entirely white? I think keeping it all white would've been better. 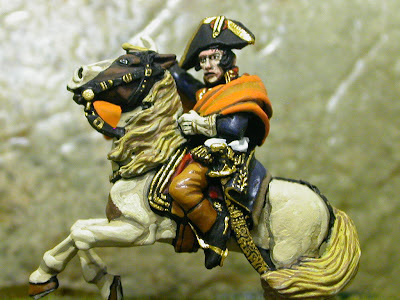 Fantastic work on that mini - but are you sure that's not actually the prince of Orange....! Maybe the camera has distorted the colour of the cloak somewhat! That's strange. The painting he has on his wall of this same image that he got from France has different colours for the horse. Includes brown-faced horse and orange cape. More than one version of the painting? Great find mate. Well done.